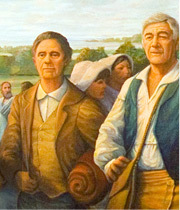 “The Arrival of the Acadians in Louisiana” by Robert Dafford, measures 12 x 30 feet and is part of an interactive online feature you don’t want to miss. 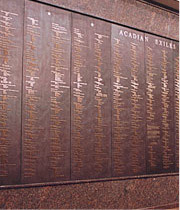 Our Wall of Names lists approximately 3000 Acadian refugees from early Louisiana records. Names are engraved on twelve bronze plaques and framed in granite. Our Eternal Flame symbolizes the ability of a culture to rekindle itself despite great hardship. 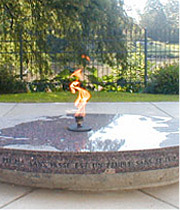 The flame rises from the center of a polished granite oval in the Acadian Memorial garden. 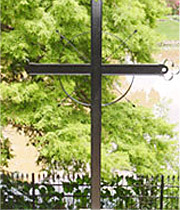 Our replica of the Grand-Pré Deportation Cross marks the site of embarkation of over 2,000 Acadian farmers and tradesmen and their families in 1755. 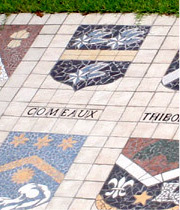 Mosaics of Acadian Family Coats of Arms, comprised of broken tiles that come together as a work of art, symbolize the families separated by exile and reunited in Louisiana. 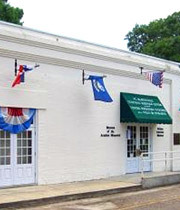 The Museum of the Acadian Memorial features interactive exhibits, the Acadian Odyssey Quilt and images from the Claude Picard Deportation Series. 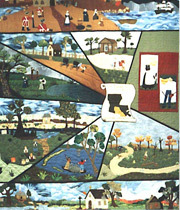 This commemorative quilt depicts the saga of the Acadians in their odyssey from Novia Scotia to Louisiana. 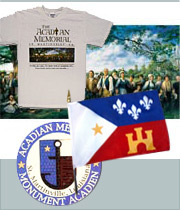 Purchase flags, DVDs, books, pins and much more on site or in our online store. Shop now!